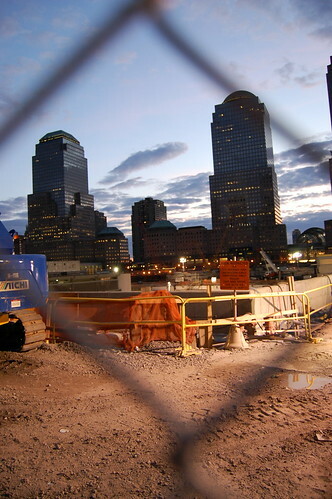 WTC site – ground zero, originally uploaded by Chandoo. This is the first of a new series of posts I am planning, “Photographic Fridays”, Every last weekday I will post a photo I have taken for your review / comments. I want to be a better photographer and all your comments are going to help me in becoming one. To begin with, this is the photo of World Trade Center site – Ground Zero, I took while I was in NY during the memorial weekend. We got down at wall st. metro station and walked to this place, it was getting dark by the time we reached here and since some construction work was going on, we were not to be allowed to the memorial site. Sorry the earlier comment was out of jealousy. The picture is Brilliant . Never seen a work of art like this before. Just the sheer brilliance of capturing the reminiscence of terrorist attack behind iron grill. Words cannot explain my admiration. The symbolism is exquisite. Dots of light must be representing hope which is at a distant future. The incomplete work would be representing the hard work that need to be put in to fullful the dream of billions . This is like poetry. By the way just couldn't understand - what the hell is the construction equipment doing in the left corner of the photograph. But not a problem, you can always rectify in your next photograph. dude any progress with my viral fever idea. I love the lighting in this photo. however because there is a lot happening in the background I felt that the out of focus fence was a bit disturbing. But hey, I love the whole idea of this thing called "Photographic Friday".